bilateral and small group meetings. We request attendees conduct meetings strictly during these times, or before/ after the session programming each day. Refer to page 4 for bilateral meeting rooms. Kick off the event with the Annual Golf tournament in a championship course amidst scenic ocean views. Awards will be presented for the Longest Drive – Men’s, Longest Drive – Women’s and Lowest Score, during Monday’s networking reception. assign ticket priority, as well as automate interactions with the back office to help quickly resolve customer issues. Using a SWIFT Service Bureau to Integrate Global Payments FNBPA and INTL FCStone discuss INTL FCStone’s recent acquisition of SWIFT solutions provider, PayCommerce, and what this means for banks looking to expand their global payment offering through better utilization of their SWIFT systems. Lunch and Learn Table 2 Is Your Bank Ready for Next Generation Payments? This session will discuss the rapidly changing payments landscape and what this means for your organization. Future success will depend on how well banks recognize and adapt to the ‘next generation’ of payments. Can we	learn any lessons from Europe and the introduction of PSD2 and Open Banking? What is the likely adoption roadmap for API payments in North America? What benefits have come from the migration to ISO 20022, and what further challenges lie ahead? Relax and unwind as you network with your colleagues and clients. The annual golf and fun run/walk winners will be announced during this event. New technologies are facilitating the inter-connectivity between the players and the platforms. A few years back, banks were feeling threatened by the emergence of fintechs. Fast forward, fintechs are very much present today and banks are still and will continue to have an important role to play as providers of the financing. The newer technologies, APIs, blockchain, and AI are all enablers to enhancing the process, creating more efficient flow, and ultimately a better customer experience. The panel will discuss and debate these points above. Dominic A. Capolongo Executive Vice President, Global Head of Funding PrimeRevenue, Inc.
Barry Tooker Chief Product Officer and Global Head of Product Management iSoftware4Banks, Inc.
trading processes. In this workshop, we will discuss how trailblazers are breaking down the barriers between banks, and the latest initiative on interconnecting trade platforms. Join subject matter experts during these special interest topics affecting the industry today. Workshops are smaller in size for an interactive dialogue between the speakers and attendees. Use of AI and Machine Learning in Financial Crime Compliance to Reduce False Positives and Profit From It This workshop will cover use cases for AI, specifically machine learning, and look at how they can enable you to achieve greater efficiencies within financial crime compliance. We’ll look at different machine learning techniques and the underlying data requirements behind them; how data can be harnessed to build processing models; practical examples to achieve quick wins in sanctions false positive rate (FPR) reduction; and how the models are continually trained to ensure on-going lower FPR over time. Along the way, profit from reduced false hits and increased customer satisfaction. Affiliate meetings are open to committee members and invited guests only. Do you see disruption as a roadblock or an opportunity? Whether your institution is large or small, new or more established, you can apply an agile approach to problem-solving. At BAFT’s new Innovation Workshop, you’ll dive in to design thinking with hands-on, collaborative exercises posed to drive customer insights, brainstorm on implications of exponential technology, and encourage shifts from the way you do business today. Learn to think like Google, Apple and Amazon, and adapt innovative solutions to your day to day operations. This exciting new workshop immediately follows the Global Annual Meeting. Stop by the registration desk to add this workshop to your registration. SOLUTIONS SHOWCASE Copp Clark COPP CLARK is the authoritative source for holiday reference data relating to global financial markets. Our products and services enhance transactional integrity by ensuring accurate value dates and trading schedules. Our market holidays, trading hours and early closings data is recognized globally as the industry-standard. China Systems China Systems is the world’s leading Trade Finance software provider. Its flagship product Eximbills Enterprise is used by some of the largest banks worldwide to manage sophisticated trade processing requirements for traditional trade and supply chain finance. Eximbills Enterprise is supported by our front-end portal, Customer Enterprise. Currency Exchange Currency Exchange International is a full service foreign currency and international payments technology and services provider. We help our clients identify and create foreign exchange solutions, delivering a best practices approach through unparalleled customer service and integrated technology to create significant financial and operational efficiencies. Finastra Finastra delivers the broadest portfolio of financial services software in the world today. Our vision is to unlock the potential of people and businesses across the financial ecosystem. Our open platform brings parties together to collaborate, innovate, and build great customer experiences. INTL FCStone The Global Payments team at INTL FCStone Ltd. (IFL) offers a customized cross-border payment service to international and regional banks, aid and development organizations, and corporates. Through its network of over 300 correspondent banking relationships, IFL allows banks to make local currency payments for their customers to over 175 countries and in 140 currencies. Kyriba Kyriba offers a pre-built, commercially available cloud platform for financial institutions to deliver supply chain finance to their corporate customers. Kyriba, a leader in corporate finance and payments software, enables banks to simplify the go-to-market for supplier financing products by integrating with existing banking technology and branding to bank specifications. Persistent Systems Persistent Systems builds software that drives the business of our customers. Our customers are software product companies and enterprises across industries with technology at the core of their digital transformation. We focus on the “how” of digital transformation to build design and data-driven applications and software-driven businesses. For more information, please visit www.persistent.com. SwapsTech SwapsTech is a rapidly growing, innovative banking technology solutions provider. SwapsTech offers a front to back, multi-currency bank operating system with solutions for domestic and cross border payments, foreign exchange, trade finance, and other treasury management services. SwapsTech’s desire is to bring cutting edge technology to banks, implement it quickly and painlessly, and keep our customers at the forefront of the modern age of digital and open banking. Co-Founder, Chief Data Scientist SmarterHQ Mr. Dean Abbott is Co-Founder and Chief Data Scientist at SmarterHQ. Mr. Abbott is an internationally recognized expert and innovator in data science and machine learning, with more than three decades of experience solving problems and deploying solutions for dozens of clients in customer analytics, fraud detection, and many more. He is frequently included in lists of pioneering and influential data scientists. Mr. Abbott is the author of Applied Predictive Analytics (Wiley, 2014), co-author of The IBM SPSS Modeler Cookbook (Packt Publishing, 2013), and is a popular keynote speaker and workshop instructor at data science and analytics conferences and meetups worldwide. Global Head, Trade Citi Mr. John Ahearn, a Managing Director in Citi’s Transaction Services (CTS) business, is currently responsible for global supply chain and trade finance, including export and agency financing, as well as asset optimization. Prior to joining Citi, Mr. Ahearn was with ABN Amro for eight years and was responsible for Financial Institutions and Head of Sales globally for the trade business. He also had senior roles at Bank of New York and started his banking career at J.P. Morgan as a Management Trainee. Mr. Ahearn is also on the Board of Directors for BAFT and the Pacific Rim Bankers Association. Nancy B. Amert, MBA, PMP Director, Trade Innovation Lab CGI Ms. Nancy Amert has 25+ years’ experience in credit and trade and is a recognized thought leader in supply chain finance (SCF) technologies used by global banks and their corporate customers. As Director of CGI’s Trade Innovation Lab, she is helping to lead and shape the strategic direction of the CGI Trade360 SaaS platform and its evolution into a fully integrated global solution for traditional trade, payables, receivables, collateral management and cash management. Ms. Amert and her team are actively engaged in the exploration of Blockchain/DLT solutions, emerging technologies and intelligent processing automation (IPA) for trade finance and supply chain. Regional Head of Americas Global Head of Correspondent Banking, Transaction Banking Standard Chartered Bank Mr. Anurag Bajaj is Regional Head for the Americas and the Global Head of Correspondent Banking for Standard Chartered’s Transaction Banking business. As the head of the Americas Transaction Banking business, he leads a team responsible for developing and implementing trade, cash and securities services propositions for Standard Chartered’s Corporate and Financial Institution clients. He also leads sales, product, innovation and service teams globally for Correspondent Banking propositions offered to clients in 100+ countries. Prior to this, Mr. Bajaj was Head of Sales for the Correspondent Banking business. management of the origination and delivery of supply chain, receivables and trade finance products that provide liquidity, risk mitigation, and working capital optimization for the bank’s Corporate, Commercial and Business Banking clients. He is based in New York. Prior to joining the bank in August 2018, Mr. Brady was the Americas region executive for JP Morgan’s Global Trade & Loan Products business. Kimberly Burdette Chair, BAFT Senior Vice President and Manager International Financial Institutions PNC Bank NA Ms. Kimberly Burdette is a Senior Vice President in Capital Markets for PNC Bank and the manager of its International Financial Institutions business. She has responsibility for the relationship, credit and compliance management of international banks with which PNC engages. PNC provides a wide range of trade, treasury management, balance sheet management and capital markets solutions and services to international financial institutions operating in the US and abroad. Ms. Burdette has worked for PNC Bank and its predecessor, Pittsburgh National Bank, for 30 years. Ms. Burdette is currently EVP of PNC’s edge act subsidiary, PNC Bank International. She also serves as a director for BAFT. President and CEO BAFT Mr. Tod Burwell is the President and Chief Executive Officer of BAFT. Prior to being promoted to CEO, he served as the Senior Vice President of Trade Products with oversight of all trade-related initiatives including the Global Trade Industry Council, Trade Committees, and other strategic initiatives of the organization. Mr. Burwell has nearly 30 years of trade, supply chain and cash management experience as a banking practitioner, as well as serving as a consultant to global corporations and suppliers of strategically integrated trade solutions. Prior to joining BAFT, Mr. Burwell was a Managing Director at J.P. Morgan Chase and held senior global management roles responsible for trade operations, launching the logistics business and managing global product sales for trade finance and logistics management. Executive Vice President, Global Head of Funding PrimeRevenue, Inc. Mr. Dominic Capolongo joined PrimeRevenue in 2016, and is responsible for leading our bank and capital markets funding strategies and execution. He focuses on building global, scalable and highly efficient funding structures that maximize options for supporting PrimeRevenue’s programs. Mr. Capolongo began his career as an attorney and was a partner with Kaye Scholer before joining DLJ as a senior banker. He brings tremendous strategic and capital markets experience in all areas of finance having held senior positions at, among others, Credit Suisse and RBC Capital Markets in addition to DLJ. Partner Albright Stonebridge Ms. Amy Celico is a Principal of Albright Stonebridge Group (ASG) and leads the firm’s China team in DC. With over 20 years of experience, Ms. Celico helps clients develop and implement strategies to deepen relationships with stakeholders, resolve complex problems, and expand their business. Prior to ASG, she served as Senior Director for China Affairs at the Office of the U.S. Trade Representative; Deputy Director of the Office of the Chinese Economic Area at the Department of Commerce; and at the Department of State, including as a diplomat in Beijing and Shanghai. Mr. Nicolas Darveau-Garneau (“Nick”) is Google’s Chief Search Evangelist. He works with Google’s most sophisticated advertisers to help them improve the profitability of their Google marketing investment. Previously, Mr. Darveau-Garneau ran Google’s search specialist team and the USA and Canada’s performance sales teams. He also launched and managed Google’s Montréal office. Mr. Darveau-Garneau has been an Internet entrepreneur since 1995. He was part of the founding team of MSN.com; was the co-founder of four Internet companies (imix.com, Liquor.com, BigDeal.com, and Fanhood) and has advised many companies like Famo.us, SommSelect, Poka, Idilia, and more. Head of Global Trade Strategy & Research R3 Ms. Alisa DiCaprio is the Head of Global Trade Strategy at R3 in New York City. She joined from Asian Development Bank where she was a senior economist working on digital trade, trade finance and innovation. She has also worked in both the public and private sectors on export promotion, trade negotiations, and labor issues. Her PhD is from MIT. Mr. Tom Deutsch is CTO for IBM’s Industry Solutions group, focused on emerging business models, disruptive technologies, and lean analytics methodologies. Mr. Deutsch has responsibility for designing and building Cognitive solutions that span IBM Watson, Software, Cloud, Research and GBS. He has created & launched many data science as a service offerings and authored papers on emerging analytics methodologies that change the art of the possible. In Q1 2015 the programs that he invented were expanded to a global IBM initiative. Prior to this Mr. Deutsch was Program Director on IBM’s Big Data Team. He played a formative role moving SoSQL technology from Research to IBM Software Group. Head of Channels, Analytics & Innovation, Treasury Services Head of Blockchain Initiatives, Corporate & Investment Bank JP Morgan Mr. Umar Farooq is the Head of Digital Treasury Services and Head of Blockchain for the Corporate and Investment Bank (CIB). Prior to his current role he was the Head of CIB Fintech and the CFO responsible for financial oversight and business management across Technology, Operations, and Controls. Previously he held leadership positions in Chase Bank including Head of Small Business Segment and National Sales Manager for Chase Business Banking. Mr. Farooq joined JP Morgan in 2009. Before joining JP Morgan, he was the Chief Sales Officer for CIT Group where he led revenue growth across middle market and specialty lending businesses globally. Senior Director, Product Management Early Warning Mr. Eric Foust is Sr. Director, Product Management at Early Warning Services. In his role, Mr. Foust is responsible for the enterprise product platform that delivers wholesale banking products, including Disbursements with Zelle®. His is responsible for the strategic direction and new product development for wholesale related initiatives. As a subject matter expert on Zelle, Mr. Foust leads strategic discussions with financial institutions, partners, and providers. Prior to joining Early Warning in 2016, he was the team lead for PNC’s Treasury Innovations team. Additionally, he has held a number of payments and relationship development roles during his twelve year career at PNC Bank. Executive Vice President, Head of Innovation Wells Fargo Bank Ms. Lisa Frazier is the head of Wells Fargo’s Innovation Group, an enterprise-wide organization devoted to accelerating the company’s delivery of next-generation, customer-inspired technologies, products, and services. The Innovation Group leads programs in Artificial Intelligence (AI), Distributed Ledger Technology (DLT), research and development (R&D) in new technologies, the Wells Fargo Startup Accelerator, and Greenhouse by Wells Fargo, a mobile-first banking experience geared toward improving financial health and planning to customers who need it, like students or others who are new to banking, or those who are paid irregularly. Prior to Wells Fargo, Ms. Frazier led highly regarded digital programs as the Chief Digital Officer for Commonwealth Bank of Australia (CBA) and as a Partner at McKinsey & Company. Director, Global xRapid Partnerships in Business Development Ripple Mr. Ryan Gaylor is responsible for building out the global infrastructure and partner ecosystem for Ripple’s xRapid product. He has nearly 20 years of experience across FinTech, treasury and capital markets. Mr. Gaylor started his career in FinTech as a product manager at Parlano. Post graduate studies at Northwestern, he worked on the equity desk at Baird, building out the desk analyst team to add quantitative and thematic research to Baird’s award winning fundamental research. Prior to joining Ripple, he managed the client and mid-market business for the Americas at Reval, a leading SaaS Treasury Management Systems. Executive Director, Treasury Services JP Morgan Ms. Thérèse Giambona is part of the Network and Partnerships team at JP Morgan. She is responsible for JP Morgan’s cash agent network as a Product. Globally Ms. Giambona connects the governance framework with Wholesale Payments and other critical functions like Treasury, Cash Management and Operations to deliver comprehensive and innovative solutions to the business. Before joining JP Morgan, Ms. Giambona managed the bank network for Western Union Business Solutions. In 2017, she participated in BAFT’s Future Leaders program. Executive Vice President Global Head, Trade & Receivables Finance HSBC Bank Ms. Patricia Gomes is Head of Global Trade and Receivables Finance (GTRF), North America for HSBC. In this role, she is responsible for leading and managing the GTRF business across Commercial banking and Global Banking clients. With 20 years of experience in banking, Ms. Gomes joined GTRF from the Financial Institute Group (FIG), where she was Head of North America. She has worked for HSBC since 2004 in a variety of roles in London, Hong Kong and New York. Prior to joining HSBC, Ms. Gomes worked with Citigroup, in Financial Institutions coverage and Credit Risk Management in both London and Lisbon. Partner Silicon Foundry Mr. Steve Gotz knows a bit about emerging corporate ventures and advanced technology initiatives after more than 25 years working with corporate executives in a range of industries across five continents. Over the course of his career he has worked with a diverse group of international organisations to develop and launch emerging technologies and new ventures including: AT&T, Microsoft, IBM, Huawei, GE, Symantec, Nationwide UK, Oxford University, Umpqua Bank, Trinity College Dublin, Science Foundation Ireland and the Irish Economic Development Agency (Enterprise Ireland). (NASDAQ: TLRY) where she serves on the Audit Committee as well as Nomination, Governance and Compensation Committees. Ms. Greenwood also serves on the Board of the Foundation for Art and Preservation in Embassies (www.fapeglobal.com) where she serves on the Executive Committee as chair of the Communications Committee, and previously as Secretary of the Board. In addition, she serves as Advisory Director for a tech start up (HYR) and a non-profit (Hostage US). Vice President and Chief Economist Export Development Canada Mr. Peter Hall joined Export Development Canada (EDC) in November 2004. With over 25 years of experience in economic analysis and forecasting, Mr. Hall is responsible for overseeing EDC’s economic analysis, country risk assessment and corporate research groups. In addition to preparing strategic advice for senior management and EDC, Mr. Hall is a featured speaker at conferences, international roundtables and policy fora, and regularly appears in television, radio and print media commenting on the world economy and Canadian international trade issues. He produces a widely circulated print and video weekly commentary covering an eclectic range of current global economic issues. Co-Founder and Development Director Understood Connections Mr. Rick Leander has been driving innovation and change in the financial services space for decades at some of the world’s largest financial institutions. Now, as Co-Founder and Development Director of Understood Connections he leverages Behavioral Economics to understand how we actually analyze choices and make decisions. Using this science he works with Financial Institutions, Health Care Providers and entrepreneurs to help them reshape their environments to improve their connections with their customers, employees, members and patients. He is in demand as a speaker on Behavioral Economics, Payments, Innovation and Company Culture development. Managing Director and Global Head, Financial Institutions TD Bank Mr. Tarik Muzaffar is Global Head of Financial Institutions within Global Transaction Banking, overseeing regional teams in Toronto, London, and Singapore. Mr. Muzaffar is responsible for Cash & Treasury Management solutions and relationship management for Financial Institutions. He joined TD Securities in 2002 with coverage responsibilities for financial institutions in Latin America, Caribbean, and Asia-Pacific. Mr. Muzaffar moved to London, England in 2009 as Regional Head of Global Transaction Banking for EMEA, where he built a coverage team before returning to Toronto in 2013, taking global responsibility for the business. Prior to joining TD Securities, he held various roles in Corporate Cash Management at TD. SPEAKERS with over 25 years’ experience in financial markets, including 12 years at Powerex and prior to that Infowave Software, the Toronto Stock Exchange and Toronto Dominion Bank. His broad business experience includes cash management, client coverage, risk management, trading and corporate finance. Senior Vice President and Manager, International Fulton Financial Corporation Ms. Amy Sahm joined Fulton Financial’s International Group in 2002 following a long-term career in the Japanese banking and trade industry. She works as department manager, overseeing product development, operations, sales and risk management. The International Group at Fulton is responsible for foreign exchange risk management and all international transactional products and services including Trade Finance for Fulton’s customer base. The International Group primarily serves import/ export SME clients within Fulton’s five state footprint. Head of North America SWIFT Mr. David Scola has recently been appointed as SWIFT’s Head of North America. He is responsible for key client relationships and business development across the region. Prior to joining SWIFT, Mr. Scola served as the Global Head of Financial Institutions of Corporate Banking at Barclays London. Previously, he held senior positions at Deutsche Bank and Bank of New York in product management and strategy across various transaction banking products including custody, corporate trust, cash, trade and liquidity. Global Vice President Blockchain Leader for Financial Services IBM Mr. Saket Sinha is Vice President & Global Leader Blockchain for financial services. He leads Blockchain solutions for Financial Services globally. He brings deep expertise in convening Blockchain networks around financial services uses cases and new opportunities for our clients. Mr. Sinha is responsible for growing IBM’s Blockchain business in financial services across our banking, insurance and financial markets clients. He brings years of experiences in financial services business model, technology and architecture related to digital transformation, payments, platform banking, core banking, marketplace banking, mobile commerce, cloud based business models, intelligent automation addressing both revenue and cost drivers while helping financial institutions shift towards the new digital age. and Chief of Staff for ING’s global corporate and institutional business based in Amsterdam. Senior Vice President, Global Payments INTL FCStone Ms. Sue-Ellen Speight is a Senior Vice President for Global Payments at INTL FCStone Ltd, leading the West Coast region for the Global Payments business unit. She holds a Bachelor of Commerce degree from the University of Queensland, Australia where she trained as an accountant, further completing an Executive Program in Strategy and Organization at Stanford University, CA. Prior to joining INTL over five years ago, Ms. Speight spent her finance career working in Banking and Management Consulting in the UK and emerging Fintech in the Bay Area. She is interested in globalization trends, emerging technologies and how traditional business models adapt to new market forces. Global Head of Banks and Corporate and Institutional Clients Americas UBS AG Mr. Christian Stolcke is a Capital Markets and Transaction Banking veteran who spent his career successfully growing service businesses and implementing large scale performance improvement programs across Shared Services, Operations and Technology. Mr. Stolcke holds a dual role at UBS as Global Head of Banks and Head of Corporate Subsidiary Banking in the Americas, both within the Corporate and Institutional Client Business. He is responsible for managing relationships with global banks and regulated broker from a coverage, risk and strategic perspective. Furthermore, he oversees the Transaction Banking business serviced out of Switzerland, which encompasses Cash, Securities and Trade & Export finance for Financial Institutions. Global Head, Visa B2B Connect Visa Business Solutions Visa Mr. Ajith Thekadath is the global head of Visa B2B Connect, a platform designed to give financial institutions a secure, fast and predictable way to process cross-border B2B payments. Mr. Thekadath leads a global team that works with financial institutions and technology partners around the world to pilot new ways of sending transactions over Visa’s multilateral network. Prior to this role, he was the global head of Multinational Premium program at Visa, a leadership role that he assumed in September 2011. Mr. Thekadath joined Visa in March 2008 as the regional head of multinational program for Visa in Asia Pacific, based out of Singapore. Mr. Barry Tooker is the Chief Product Officer and Global Head of Product Management for iSoftware4Banks. He has been involved in operations and systems related projects for global banks and software firms as both a consultant and line manager for more than 45 years. Mr. Tooker has managed day to day operations for major money center and super regional banks. He has planned, organized, directed and managed major initiatives—including leading payment systems re-engineering efforts and other critical software installation projects for financial services organizations around the world. He is past member of the BAFT Board of Directors and past Chair of the Payments and Compensation Committee. Chief Product Officer and Global Head of Product Management iSoftware4Banks, Inc.
Executive Vice President, Chief Innovation Officer U.S. Bank NA Mr. Dominic Venturo is an executive vice president and Chief Innovation Officer at U.S. Bank. He has been with U.S. Bank for nearly 20 years and has led the innovation strategy for more than 10 of those years. Innovation is core to the future that U.S. Bank is creating for customers of all types – from consumers to businesses and institutions. The innovation team works closely with partners across the company to harness emerging technology and processes. They create the environment within the bank where these innovations are tested, adjusted and brought to market so customers can conduct their business how and where they want, safely and conveniently. Mr. Gerald Walker was appointed Chief Executive Officer of ING Americas in July 2017. Prior to that he has held a range of senior positions with ING – most recently as CEO UK, Ireland, Middle East & Africa. Non-executive positions have included: Chairman of the Board of The Association for Foreign Banks (UK); Board Director of TheCityUK, Board Director of the European Association of Banking & Financial History (Germany) and Member of the Wholesale Advisory Committee of the British Bankers Association. new business growth. In addition, he provides a critical role in client relationship management with high-value clients. Mr. Ward also brings his wealth of experience to The Clearing House, where he serves as Chairman of the Board. Head of Global Financial Institutions and Global Government Banking Sales, Global Transaction Services Bank of America Merrill Lynch Ms. Stephanie Wolf is managing director and head of Global Financial Institutions and Global Government Banking Sales for Bank of America Merrill Lynch Global Transaction Services. In this role, she leads a team of treasury services sales and product professionals worldwide for a number of industries including banks, governments, investment managers, securities firms, insurance and specialty finance companies. Each team is accountable for the sale of global cash management, trade and supply chain finance, commercial card, balance and investment solutions, as well as maintaining and strengthening key client relationships. In addition to these responsibilities, Ms. Wolf manages the GTS high risk client team. Managing Director and Client Executive, North America Banks & Broker Dealers, Treasury Services JP Morgan Mr. Peter Zotos is Managing Director and Client Executive for the North American Banks & Broker Dealers segment in Treasury Services at JP Morgan. In this role he is responsible for overseeing the growth of the client base and the delivery of cash management, clearing and liquidity management solutions for clients. Mr. Zotos has served in a number of leadership roles internationally during his career, including Global Head of Network Management and Head of Correspondent Banking for the Americas with Standard Chartered Bank and has experience across the full range of transaction banking products including Cash Management, Clearing, Trade Finance and Custody. CALL FOR 100th Anniversary Planning Team! 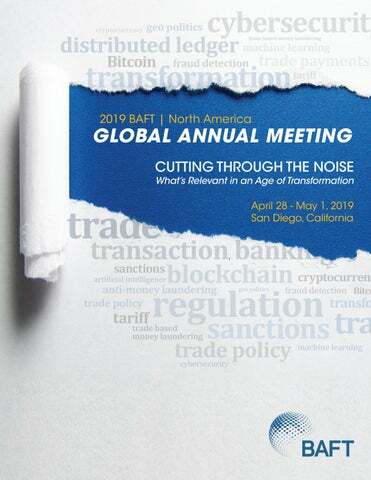 BAFT celebrates its 100th year anniversary in 2021. In preparation of this monumental event, we are seeking members who are interested in helping to plan this centennial anniversary. A special celebration will be planned during our Global Annual Meeting – The Americas in Washington DC, May 2021. Interested? Please contact Arlene Sanchez at asanchez@baft.org or stop by the registration desk. Innovation Workshop: Think Like a Start-Up!